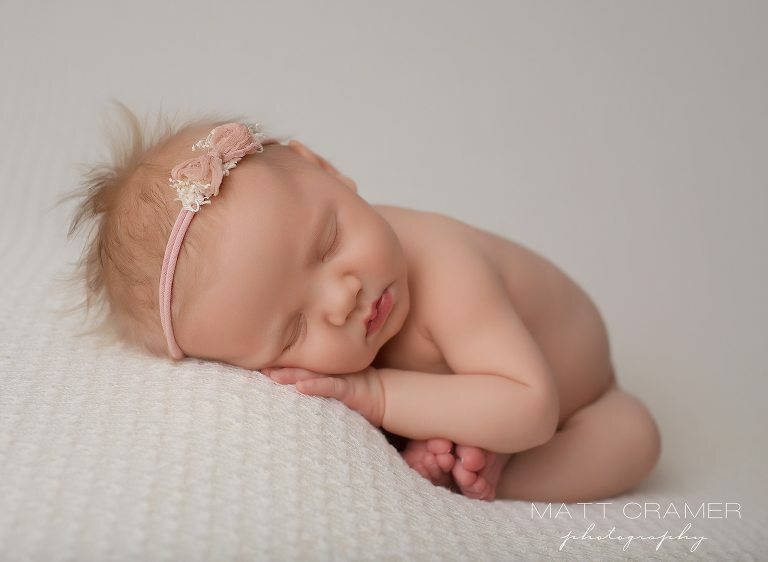 Beautiful Baby W arrived to her baby photography session sleeping peacefully. Hooray! I took one look into her car seat and couldn’t contain my excitement- that hair! Eeek!! As we took her through the various poses during the newborn photography session, she kept snoozing away. At four weeks old we were lucky she was still so sleepy! We always try to start with “bare” baby photos at the beginning of our newborn photography sessions. Sometimes newborns don’t like being un-swaddled. Therefore we always tell parents that we’ll try for these shots. But we will follow baby’s lead. Baby W was perfectly content to be bare and we captured some gorgeous, simply newborn shots! I used one of many favorite headbands from our Goodnight Moon Props collection. 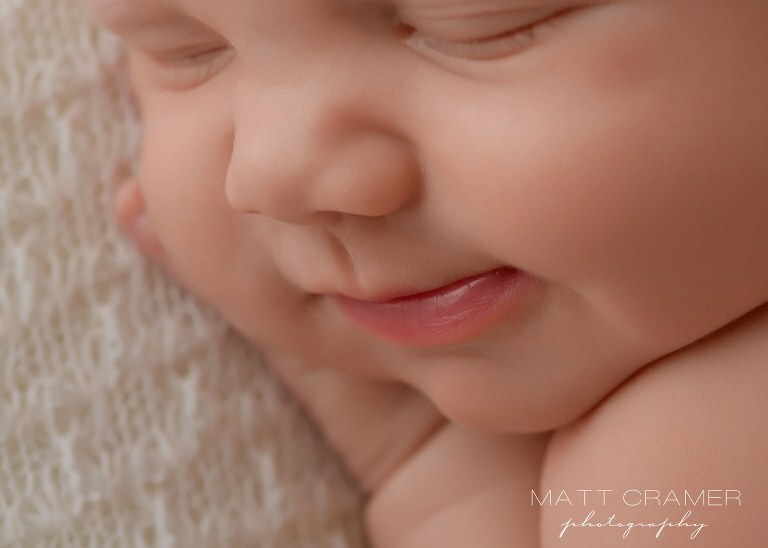 This is one of my favorite shots from the entire Sherman Oaks newborn photography session. We gently posed her into another favorite newborn pose here. And added a soft, dusty pink cheesecloth wrap for an entirely new look! Furthermore this textured fabric from Freebird Prop Shoppe is so beautiful and delicate. I love using it for girls. We caught an adorable smile! Close up, macro shots are an important part of our sessions if parents want them. How else will they remember those tiny newborn features? Sleeping peacefully with her little angora bear hat and custom handmade Minnie bear from Just Peri while we photographed her. All the elements in this image reflect our Los Angeles newborn photography style. Since we use antiqued wood props, a good amount of texture, neutral color palettes and accessories these do not distract from the beauty of the newborn baby. I especially love the way all those wispy soft angora hairs frame her perfect little face! Who doesn’t love a little baby bear?! This newborn wood bed prop is a parent favorite. We switched to a soft pink palette for this look. 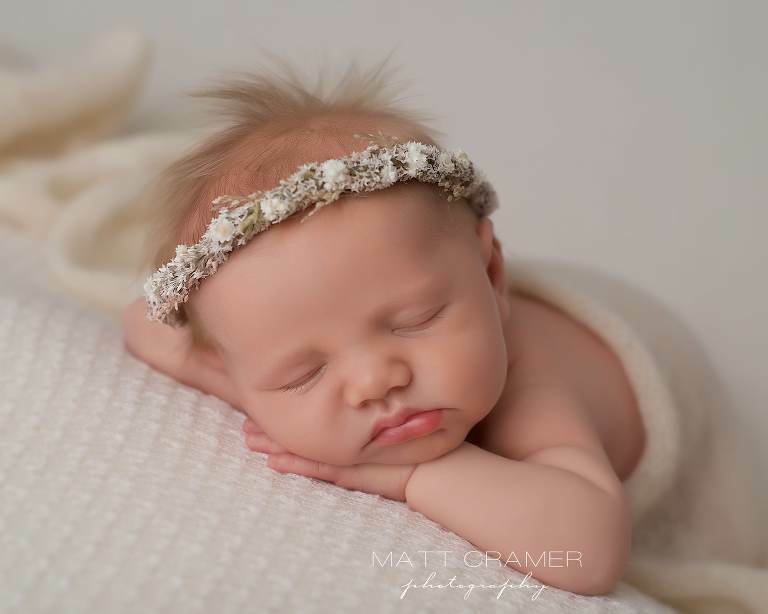 Seems like all our newborn floral halos worked perfectly in this Sherman Oaks newborn photography session! Those little toes at the bottom are too cute! We caught a little smirk! Since she was still snoozing away, we moved to what we call a “flokati” rug shot. This set up gives an especially impactful and textured look. Parents often choose this type of image for a big print or canvas in baby’s nursery. Finally, we ended with this soft peach set up and I’m so glad we did, because it turned out adorable! Looks with varying shades of a similar color are a key element in our Los Angeles newborn photography sessions!